The amount of dihedral will determine the inherent stability along the roll axis, or self-righting characteristics. Trainers usually carry an amount of dihedral for this reason. 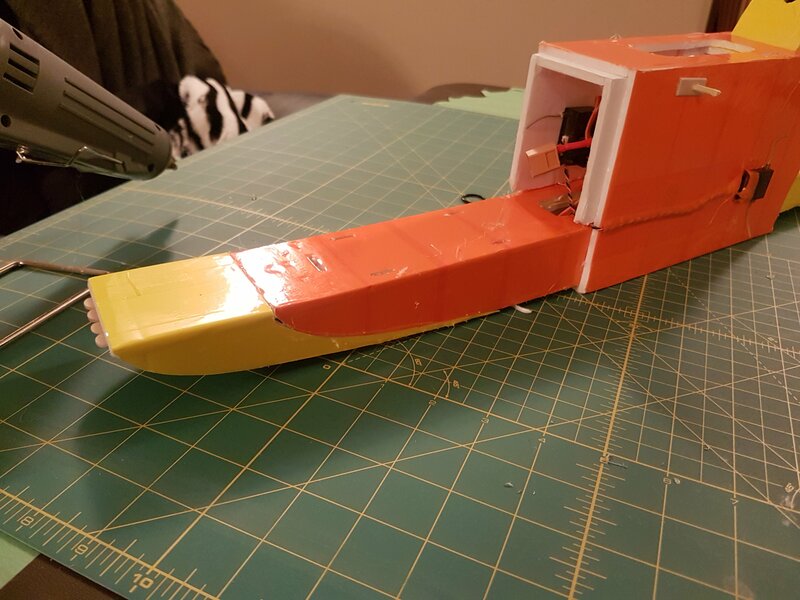 I now need to build an extension XT60 connector battery wire, dial in my throws, put in some expo, give me 3 different flight envelopes to fly with then fly it out... thanks again for the suggestions on how to hopefully make this a successful maiden.. Trying to add new skills with each new build. This one is a far cry from my first build... hope she has many successful flights!! Hmmmmm.... This thread kinda makes me want to build an explorer. What they hey I screwed up.. please help kinda thread? but first....learn to fly it. That's right, one step at a time. My Explorer was tail-heavy too. I initially shoved the tailboom further in, but it wasn't really enough to eliminate ballast entirely, plus it didn't fly as efficiently that way. Extending the nose was the way to go. I lengthened mine by 3" before the bottle neck. I did that because it gave me more room to put things in the nose, such as a camera; the bottleneck area is barely tall enough to hold the battery alone. I love the method you used to graft an extension to the battery platform, very elegant and pleasing, and a simple trace. I didn't think of that, and just did a square cut. its shall be titled from "Here to There" What I like you all to do is tell me, guess, or postulate how I got there.... There were many attempts to get from Here to There, it was not a 1 time trip.... detail my Journey in your own words.. have fun with it if you like, or make it a teaching moment if you like its up to you!! Video to follow and some of my thoughts and learnings..
About 15 minutes later here is my "There" picture. 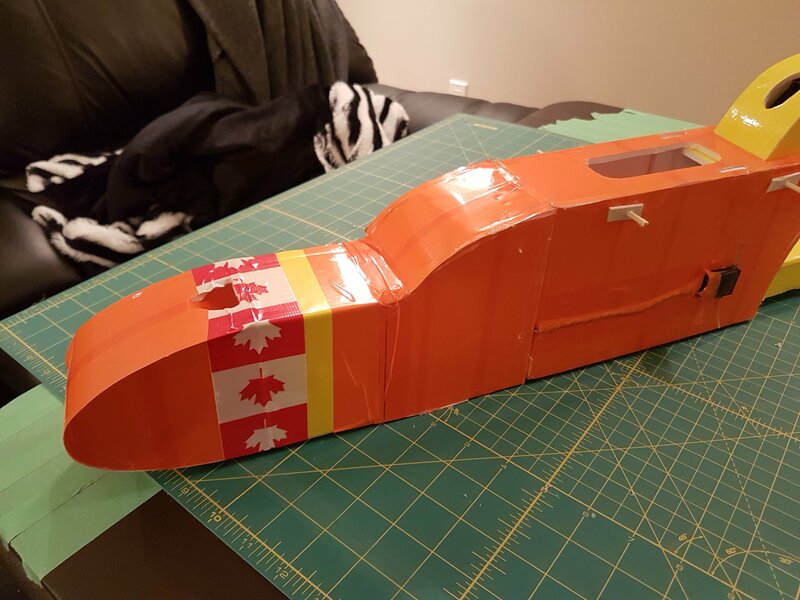 Wing split with no other damage, no crumpled nose, tailplane looks good. If you had ailerons I'd say you overcorrected on final and dipped a wing. With rudder only... and that wing that doesn't look like it has any dihedral from here, I'm guessing you lost roll control and knife edged it in. Which wing design is that? Well it looks like you didn't land directly on the nose, at least Looks like an easy fix. The Armin wing is a flat wing, so that's my guess. 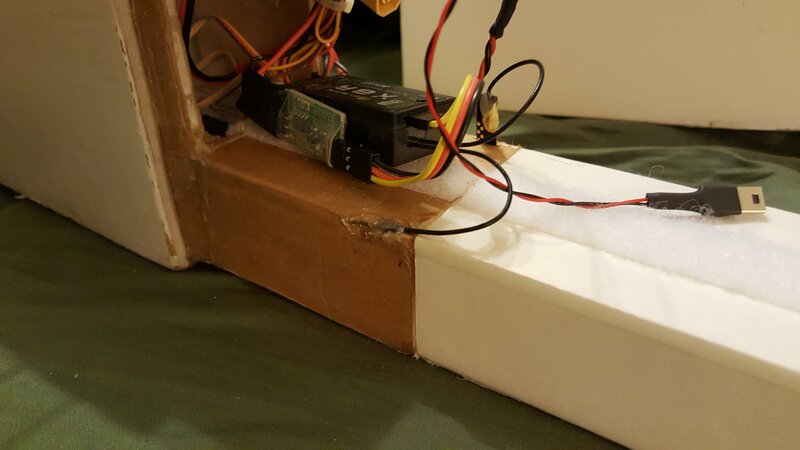 Without dihedral it won't level the wings by itself, so once you take on a little unwanted roll it will get worse and worse until you find the ground. I'm guessing aggressive dive into aggressive pull out. 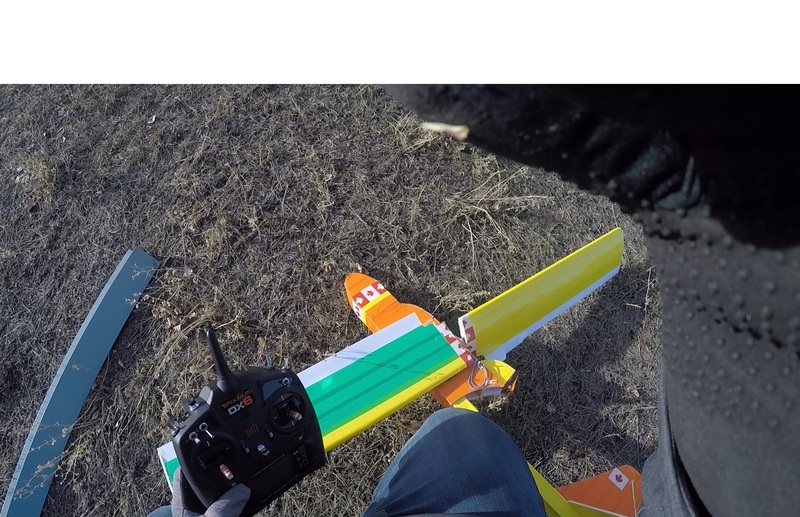 wing could not support the load and broke. Sound like I have experience? Well its because I did the same thing. 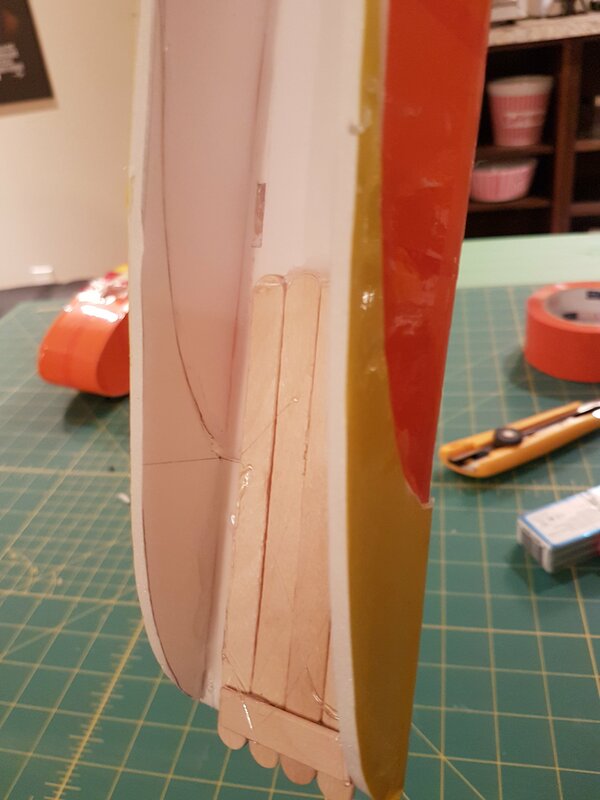 My new wing has a 1/8"x1/4" about 20 inches long glued to the back edge of the foam spar for support inside the wing. 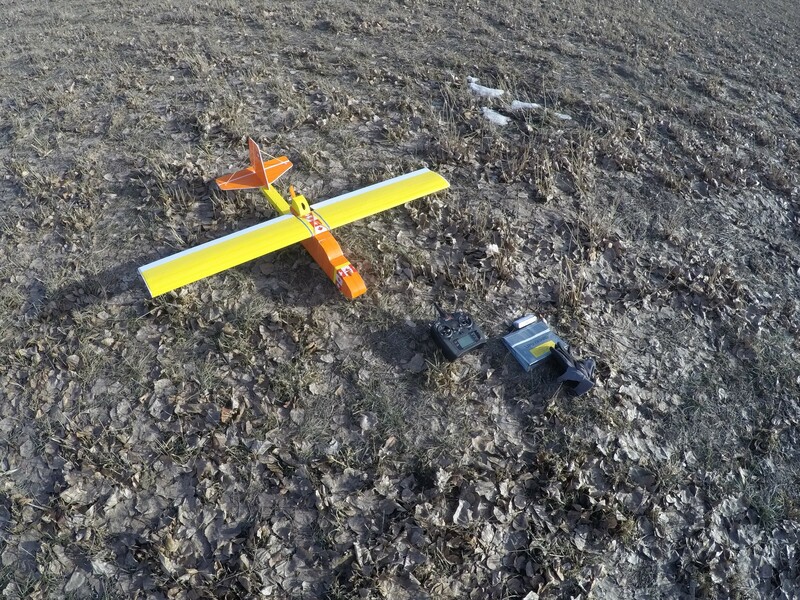 How do you fly a 3 channel plane with out dihedral? If the wing really has no dihedral and you are flying RET (rudder,elevator.throttle) only you making things quite a bit more difficult to control. Not that it can't be flown like that but the rudder control will tend to be 'lazy' and thus has to be input as a wing starts to dip not after it has! Give the rebuilt wing generous dihedral and not only will the rudder have much more roll authority but at modest bank angles it will even be self levelling. Rudder to make it bank and turn, centre the stick (or just let it go!) and it will return to straight and level flight by itself! 15 minutes? I'd guess your battery went flat and you dropped out of sight somewhere and nosed in. My second guess is you went for the power-dive-loop and overstressed the wing. Congratulations on 15 min of flight. Remember the motto: Build, fly, crash, repeat. Short Answer I found is.... You don't!!! !